The interactive live portion of this Open Space training will be delivered in a system called ZOOM which includes interactive video, audio, whiteboards, breakout rooms and chats. Important: To attend this workshop you will need a computer or tablet running a Microsoft , Apple OS or Android operating system. You can access this live, online workshop using a Smartphone but your experience will be better using a computer or tablet. Your computer will need a microphone, speakers and a stable Internet connection... the faster the better. To optimize the integration of your learning, the live portion of this Open Space Technology training will be delivered in five(5) 3.5 hour sessions spread over 5 weeks with homework assignments between sessions. You should expect 1-2 hours of homework per week in addition to the live sessions. The self-organized part of the learning in this Open Space facilitation training will take place in our online Learning Management System (LMS). In this system, you will find reading materials, videos, homework assignments and you will be able to access video replays of past live sessions. To get most out of this workshop it is essential that you do the assignments before coming to the live sessions, since live sessions are primarily designed for questions, discussions and group work and based on your self-organized learning. In the LMS you will also be able to communicate by emails and forums with instructors and other students from the course to deepen your learning and connection between live events. This Open Space training will be facilitated using the methodology of Whole Person Process Facilitation from the Genuine Contact™ Program. Using this methodology, we pay particular attention to the 'whole person' - connecting left and right brain, intuition, voice and heart (emotional intelligence). To optimize your learning, the training incorporates various learning styles including time for theory, practice, self reflection, small and large group work. You may find that in the training you are more present and connected with yourself and with others than typical online trainings. Be prepared to be surprised! Click here to learn more about or take a course in Whole Person Process Facilitation (WPPF). At the beginning of this Open Space Technology facilitation training, you will experience as a participant a short, live, online Open Space meeting to set the context for our training and to witness the power and potential of using this methodology for collaboration with virtual teams. From the experience of an actual Open Space meeting, you will then learn and integrate the essential components and essence of your experience so that you can replicate your experience for others either in-person or online. Where can OST be used? Open Space has been used around the world in almost every language and culture and with every kind of organization. It has been used effectively for a diverse range of purposes such as conferences, strategic planning, mentoring, product development, community building, visioning, sales planning, customer engagement, organizing movements and conflict resolution. Open Space Technology has been used in groups ranging in size from 7 people to 2,000! Now, with effective, stable online video and online meeting technologies, Open Space has come into the online world. Imagine hundreds of people from around the world gathering in a live virtual space, focused on a purpose, creating an agenda together and breaking out into multiple simultaneous virtual video rooms to do their work. This is what is possible and the cost savings and possibilities for team collaboration are immense. The Law of Two Feet (also called The Law of Mobility) states that if participants find themselves in situations where they are neither learning anything or contributing anything, they are responsible for moving to another place, for example to another group meeting. The principles and law enable people to participate in ways that are most meaningful to them. They get to take responsibility and contribute according to their passions, talents, skills, curiosity and energy in the best way they can in any moment. When organizations capture the energy of their people through optimal, engaged learning, passion and personal responsibility, then performance dramatically improves. People are motivated and the right work gets done! Having explained the process, the facilitator opens the meeting to let the group create the agenda by identifying topics that are important to the individual regarding the theme. The individual puts his or her topic on a sheet of flip-chart paper along with their name announces the topic to the group, and then posts the topic on the agenda wall. There is a means of assigning room spaces and times for the topics that are generated. When all the topics are up, everyone goes to this "marketplace of topics" and signs up for the topics of discussion that interest them. The facilitator gets out of the way. The group self-manages the discussions and produces a report of the proceedings at the end of their discussion for all to read. The facilitator oversees what is happening at the computer station, which is where the reports from each group get inputted. The facilitator reconvenes the group as a collective whole at day's end and in the morning again in a multi-day event. It is only with recent technological advances such as high performing live video, whiteboards and multiple online breakout rooms, that facilitating an effective Open Space meeting in the online environment has become possible. If you have the need, the knowhow and the desire, engaging people around the world using Open Space Technology is a game-changer for organizations. 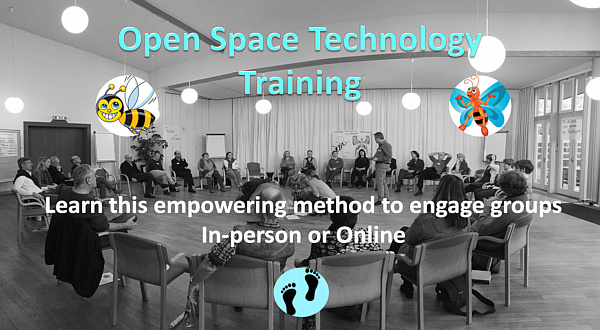 In this Open Space training, you will learn how to facilitate Open Space Technology for virtual communities and organizations. Below is an example video of an "Opening" which explains the process principles, law, bumblebees, butterflies and agenda creation for an online conference. You have a hundred people from around the world gathered together in an online space. They break off into multiple, simultaneous virtual spaces, each with a topic leader and then after that meeting is complete, they self-select the next breakout to go to in the next breakout time. All breakout discussions are recorded by someone taking notes on the highlights of the meeting and the decisions and actions to be taken with the topic. The video can be recorded too. After the breakout sessions are complete, participants gather back in the main space to share their experiences, what they learned and make more decisions. At the close of the meeting the energy is higher than in the beginning. The energy is palpable. Imagine... No speeches. No Presentations. Just people actively engaged with each other co-creating solutions from their energy and passion. It just works! This is not an imaginary meeting. This is being done now and it is a game-changer for wide-spread organizations wanting to effectively connect the wisdom of their organization - without the expense of travel. You will learn how to do this in this Open Space Technology Training! Elisabeth Tepper Kofod is known as a Facilitator of Transformation Processes, and she describes her job as helping people and organizations, especially couples and families, to ignite the light within themselves, to recognize the power they have to create the change they want to see in the world. Her experience is diverse, and she describes it as eclectic, as she has used and uses different tools according to her clients’ needs in different parts of the world. You can see her work in Elisabeth Tepper Kofod, and even if it’s in Spanish, you will find her professional profile interesting and compounding, as she has dedicated her life to studying and teaching people to realize they have what it takes to move on. She believes her job is to show them the way. Elisabeth does this in a space of safety, serenity, seriousness, and playfulness. Elisabeth has a Bachelor degree in Business Administration, specializing in Human Behavior, from Newport University, California. After more than twenty years of experience in Corporate America, she decided to dedicate herself to doing her calling. As a Genuine Contact™ Trainer, she has learned that there are magnificent ways of doing balanced, and sustainable change and growth, both individually and organizationally. Join Us In This Open Space Training! Our workshops to assist leaders in navigating change by teaching powerful tools for individual and organizational transformation. 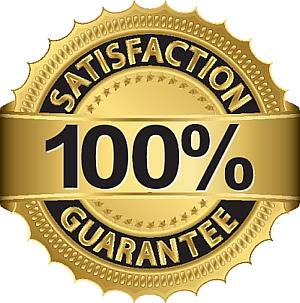 If you are not satisfied with what you receive in the workshop and the potential of the tools and processes you learn with us, then just say so and we'll give you your money back.